Hotel manager: I just went to a conference and I'm inspired to change our culture to be totally customer-centric. Hotel manager: Don't worry, I have a fantastic idea. 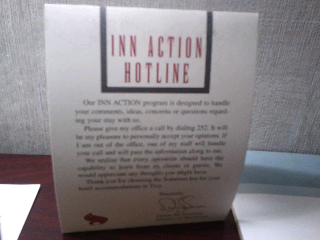 Our new program will be called Inn Action, get it? This is a REAL program at a REAL hotel I stayed at in Detroit.